Before I Die by Candy Chang. Photo courtesy of Candy Chang. Candy Chang’s Before I Die walls transform spaces and builds communities. 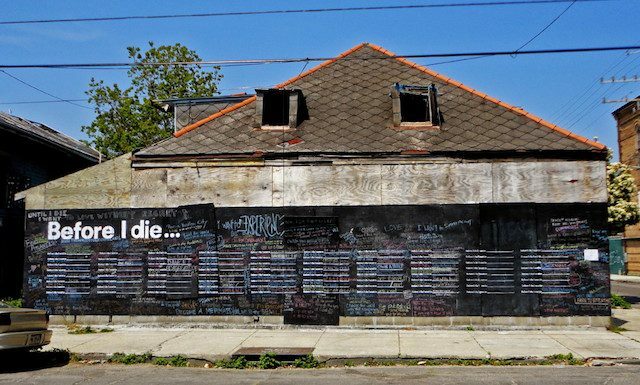 The original Before I Die wall in New Orleans is a prime example. It was painted (presumably without any formal permission) on the side of an abandoned building. In her TED talk, Chang said, “I live near this house, and I thought about how I could make it a nicer space for my neighborhood.” By painting over tagged-up plywood and posing an inviting question on a slickly designed chalkboard, Chang took a disused space and made it pleasant. As neighbors reacted and filled in the wall, they strengthened their community around shared a spectacular experience. Even if you never know exactly who wrote “Before I die I want to sing for millions” on the wall, you know that someone in your neighborhood wrote it. Artwork and photo by Caroline Caldwell. Ad busts also transform spaces. 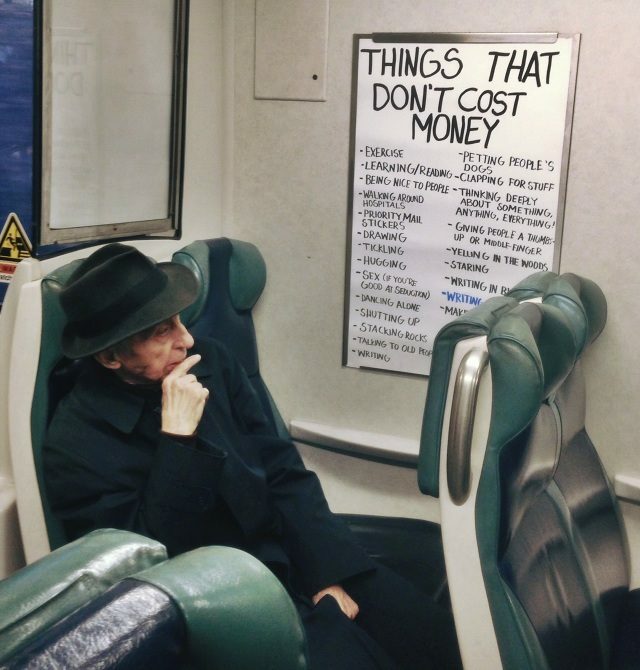 Advertising is bad for us. It nudges us towards values like selfishness and greed. Replacing advertisements with artworks, to quote Brandalism’s Global Ad Hack Manifesto, “is an act of tidying up that is both legally and morally defensible.” Ad takeovers, even when the content is something that might be considered wallpaper if it were in the form of a mural, provide a major benefit to the public. They replace psychologically damaging cues with artwork. And street art can change more than a wall. It can spur a movement. Tatyana Fazlalizadeh’s Stop Telling Women to Smile campaign raised awareness of street harassment and provided an avenue for women to fight back. I’ll admit my own privileged ignorance here. I did not know that street harassment was still a thing, because I don’t generally get harassed. 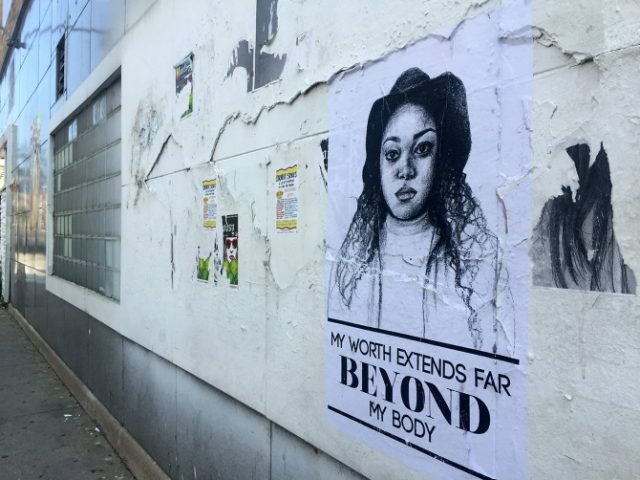 Fazlalizadeh’s posters opened my eyes to the issue. Stop Telling Women to Smile took a community that existed (women sick of being harassed on the street), and made it more visible and powerful than ever before. Stop Telling Women to Smile by Tatyana Fazlalizadeh. Photo courtesy Tatyana Fazlalizadeh. 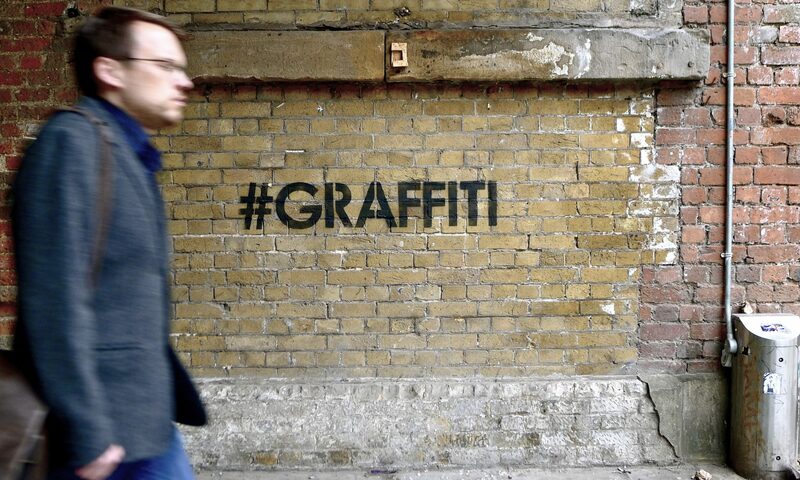 Admittedly, not everyone is comfortable working without permission, and the more established names in street art have largely shifted to working with permission. 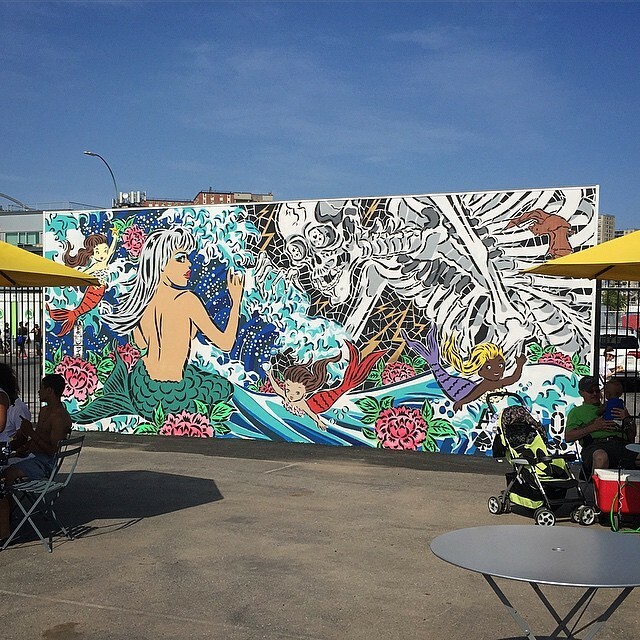 They are the latest generation of public artists and muralists. It’s naive to suggest that the only way for street art to move back toward dissent would be working without permission. Some of the best public art is made in the spirit of street art, but just would not have been possible to realize without permission. Working with permission can be limiting, but it can also open doors. Summer Kaleidoscope by Jessie and Katey. Photo by Steve Weinik. 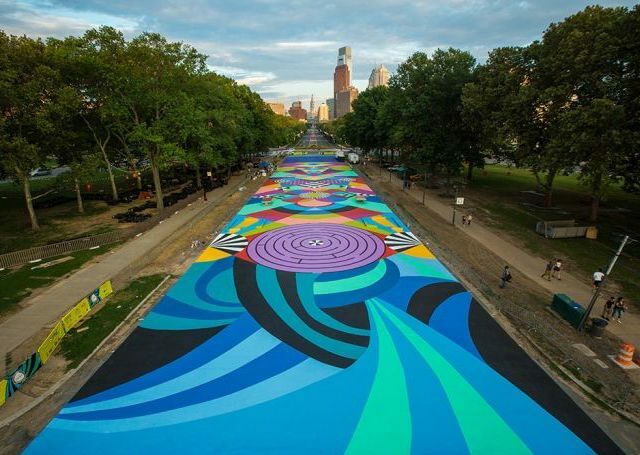 When the City of Philadelphia Mural Arts Program commissioned Jessie and Katey to paint a 33,000 square foot mural, the pair only had five days to make it happen. They needed help, and they got it from over a dozen paid assistants. And that is one of the great things about public art: You can get paid. For the assistants, that’s a week long paid apprenticeship with two of the best muralists in the country. If Jessie and Katey were painting the same piece without permission or without the robust public art funding, they would have had to rely on volunteers, an opportunity only open to those who can afford to take the time off to volunteer. And as strange as it may seem that I’m arguing that paying people is a radical proposition, paying artists to make art absolutely is. Familias Separadas: Somos Seres Humanos by Michelle Angela Ortiz. Photo by Steve Weinik. Another piece from Mural Arts that always sticks in my mind is by Michelle Angela Ortiz. I was working for Mural Arts at the time, and the night that Ortiz and activists from Juntos painted Familias Separadas: Somos Seres Humanos was a magic moment. 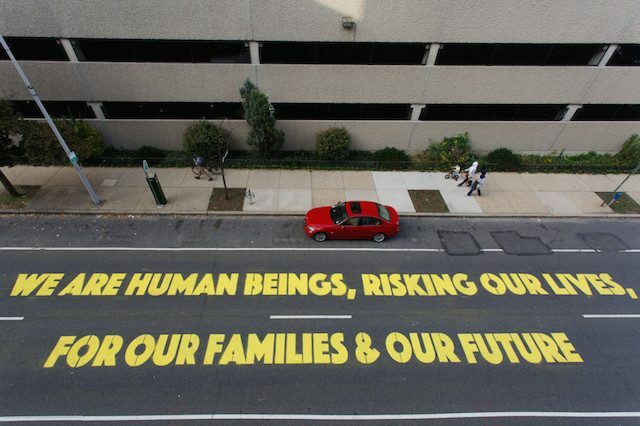 We had Philadelphia police blocking off a road so that immigrant rights activists could paint a message in the middle of the street in front of the local Immigration and Customs Enforcement offices. Activists, some of whom typically avoided that street because of the ICE offices, were there making their voices heard, with the full support and protection of city government. That piece would not have been possible to paint without permission. Too risky, and costly. But within the framework of public art, Ortiz made something closer to the ethos of street art than just about anything I’ve ever seen on the streets of Bushwick or Williamsburg. It can be done. 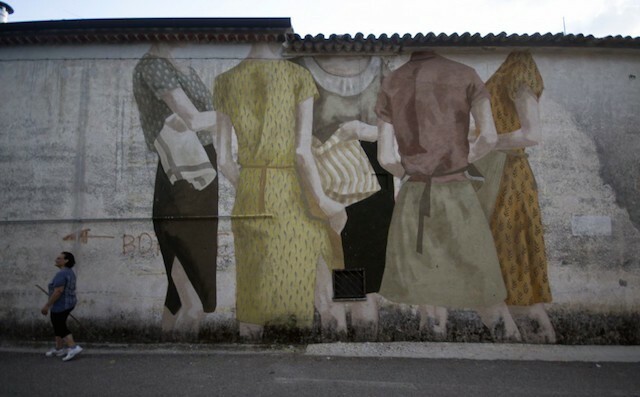 With permission or without, public art and street art can be something other than wallpaper. We can move back towards counter-culture, dissent, politics, and radical community-building. Or not. As artists, writers, curators, arts administrators, and consumers, it’s our choice.